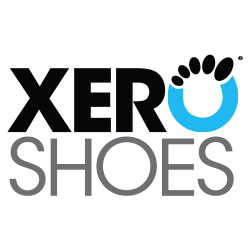 My foot health is very important to me, and I ALWAYS wear shoes that are zero drop and flexible. But sometimes I lament the cute shoe styles I am missing out on. It’s fun (and OK) to chase a trend now and again, so I’m always stoked when I find a way to marry my love of style and healthy feet. You can imagine my excitement when I discovered there were Etsy shops who will make their sandals heel-less by request. 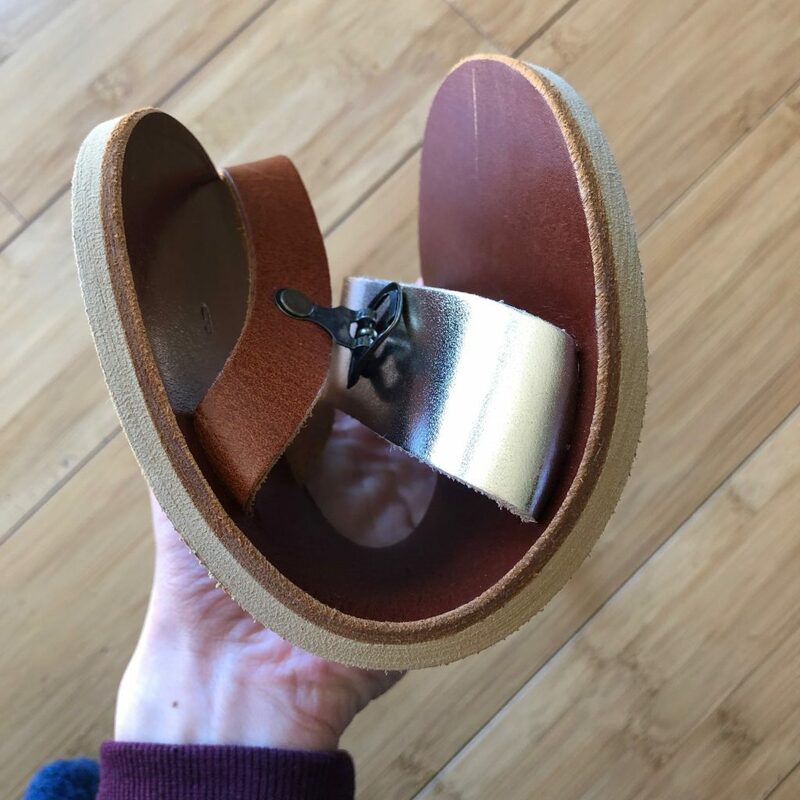 And because sandals are open, allowing for toe freedom, you don’t have to worry as much about the toe box width like you do with closed toe shoes. 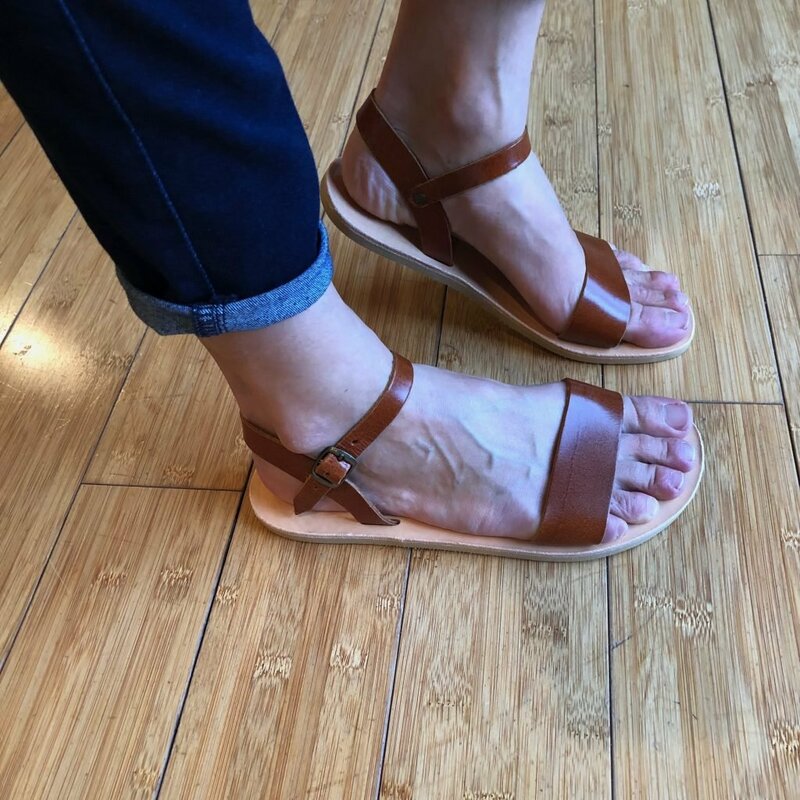 There are a handful of leather sandal companies who are willing to do this with many similar styles, but the best priced and most responsive I’ve found so far is Grecian Sandals, run by Natasa. Natasa has responded to all my messages quickly and has been more than willing to accommodate my customization requests. She designs and makes all the sandals herself and has tons of options to choose from. 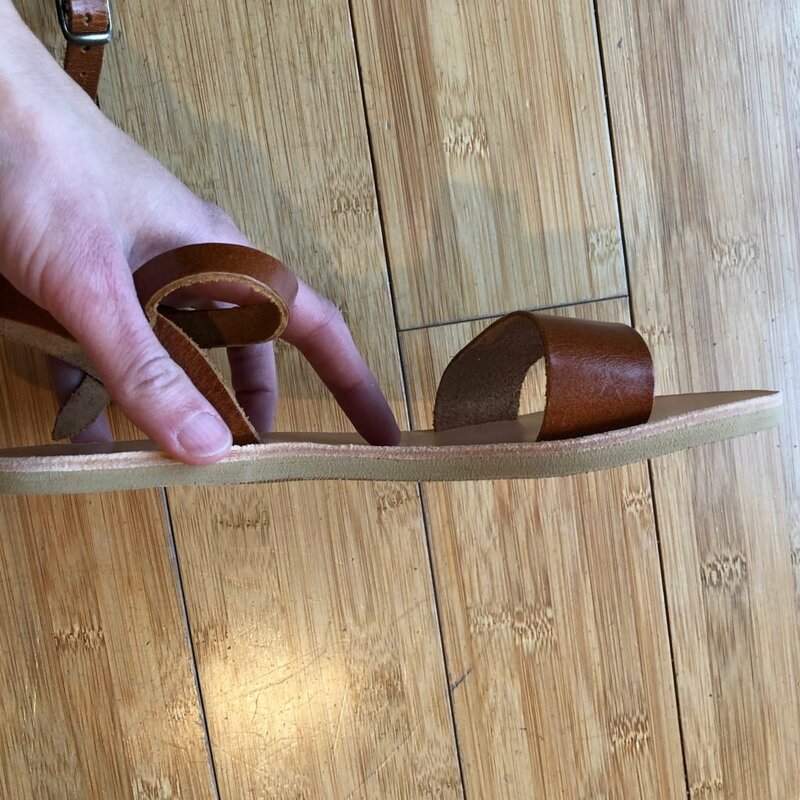 If you wish to order a pair of completely flat sandals all you need to do is write in the notes at checkout that you want them made without any heel. Her styles range from $40-$50 and shipping is $12 no matter how many sandals you order (read her policies here). Her soles are a synthetic material that come with a heel already attached, so in order to make them zero drop Natasa saws off the heel. It’s done completely evenly and you can only tell when looking at the soles of the sandals. The soles are flexible, but on the stiffer side. 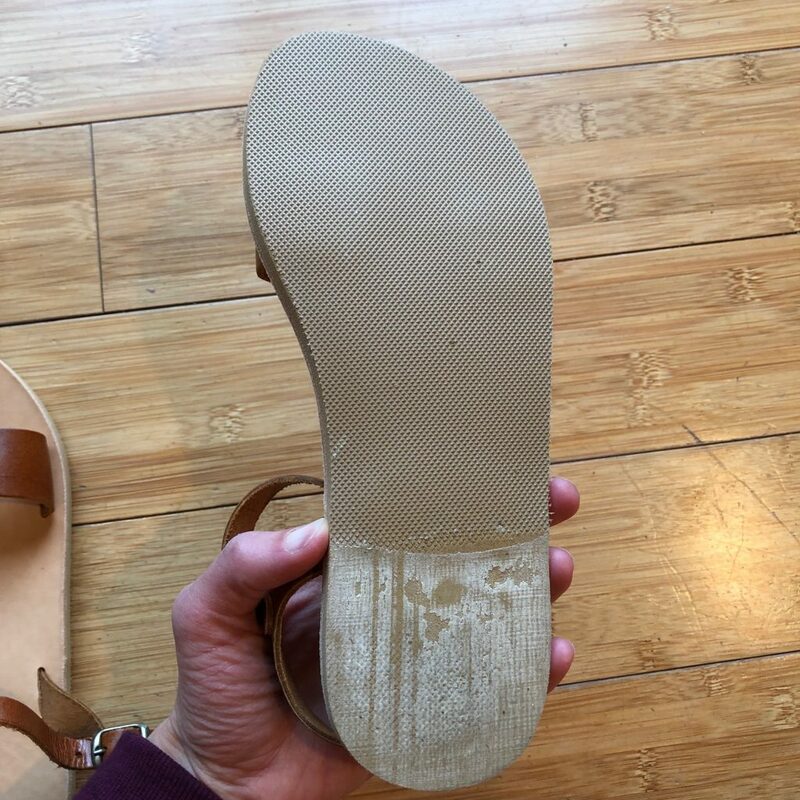 I would say it’s comparable to the stiffness of the soles used in Splay Athletics or Zuzii Footwear (though both those companies use rubber soles, which is a natural material as opposed to plastic and loosens over time. I don’t know yet if these soles will loosen). The insole and sandal upper are made of unstructured leather. Not all of her styles will be barefoot friendly, so pay attention to strap placement. My favorite is this simple ankle and ball strap sandal. It’s timeless and stylish and almost exactly like a pair of shoes I loved before I transitioned. I used her size chart to determine I was a size 36, which according to her chart is a US size 5. Every size chart is different, so definitely measure and follow hers (included in the description of each listing) instead of ordering your usual size. And of course, reach out to Natasa with any questions you have. I asked for a little extra width in the ball strap when I ordered mine and they came out lovely. The strap placement is good; over the ball of my foot but not pressing my toes inward. It’s hard to tell in the pics, but the leather is not tight over my toes and they can move and splay while I walk (my pinkie toe naturally turns in a little). 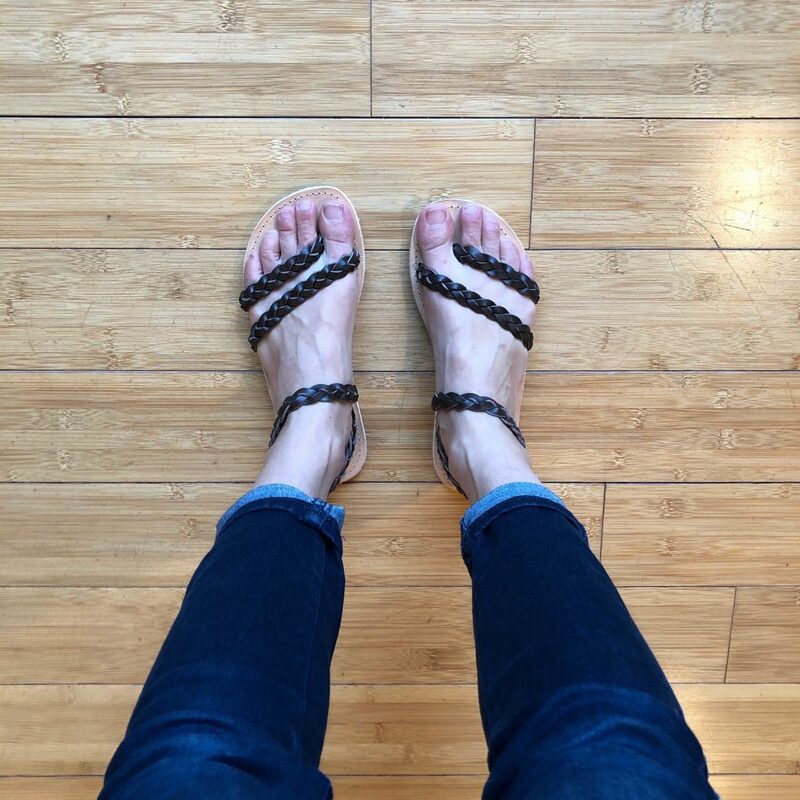 Many of my readers have already ordered sandals from her shop, and she’s been great to accommodate everyone! Remember these are handmade and coming from overseas, so you’ll have to be patient for a few weeks while they get to you. They are worth the wait! 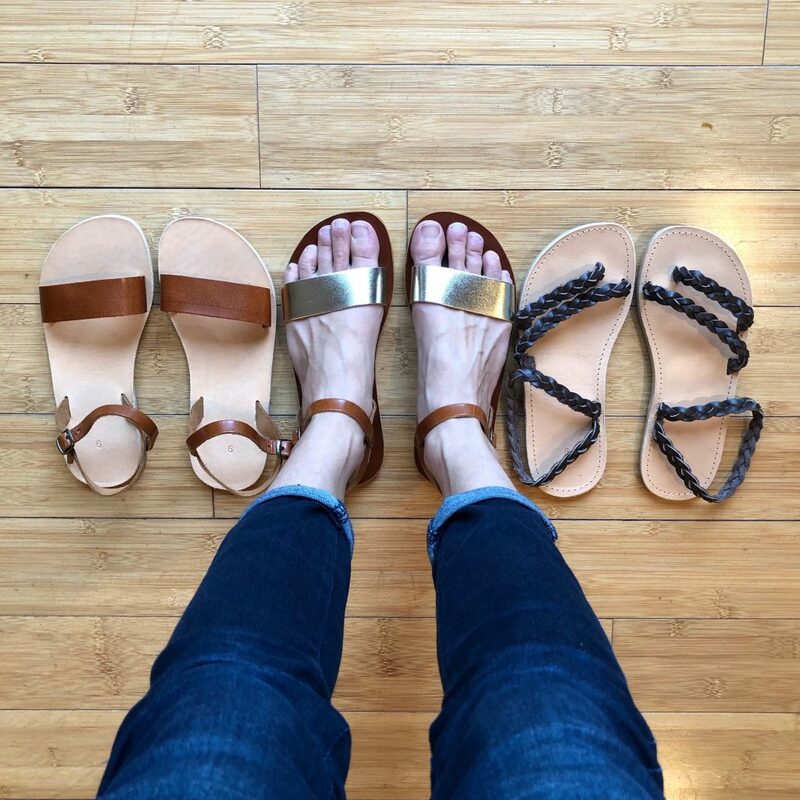 I’d love to hear how your Grecian Sandals work out for you!